Benito and Toni Trevino invite you to visit! What does Rancho Lomitas offer? (956) 500-1392 or email info@rancholomitas.com for reservations on this tour or to book your private tour. 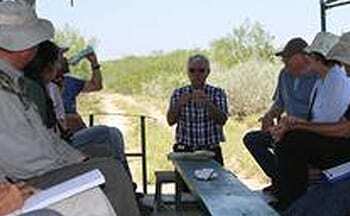 The tour will focus on the many uses of the native plants of South Texas. Want to spend more time here at Rancho Lomitas? 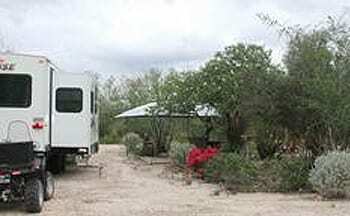 Come stay in one of our RV sites. They all have 50 and 20 amp connections, water, and sewer. Five of our sites also have 30 amp connections. The site above is one of our most requested. Now is the perfect time to add native plants to your landscape. We still have plenty of butterfly plants, both nectar and host plants. 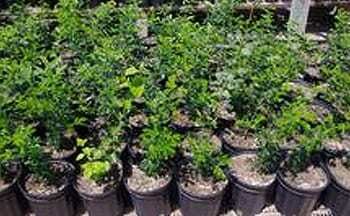 Call or email to find out if we have what you are looking for in the nursery. Ranchers interested in adding quality deer browse should call for planting in October and November. If you are looking for quiet comfort with nature all around you, our casitas are just what you are looking for. Each casita is fully furnished including a fully stocked kitchen. All you need to bring is your favorite food and drink! Jim, our resident naturalist, has published dozens of articles on the "wild things" one can find in South Texas. Read one of his articles on Jim's Wild Things page.